After buying bottle after bottle of vanilla extract I got tired of running out so fast and spending the money. The taste cannot even be compared to that of real vanilla, so I thought - why not make my own? Its takes about 8 weeks of patience, but the recipe is so simple and totally worth the wait. I bought whatever 80 proof liquor that was reasonably priced - for this recipe I used Smirnoff vodka along with a few splashes of E&J bourbon. Your extract vessel must be clean, airtight and glass - for example: canning jars, the leftover bottle of vodka, recycled kombucha bottles.. anything of that nature. The photo below shows my vanilla before and after having been steeped for just a few months. 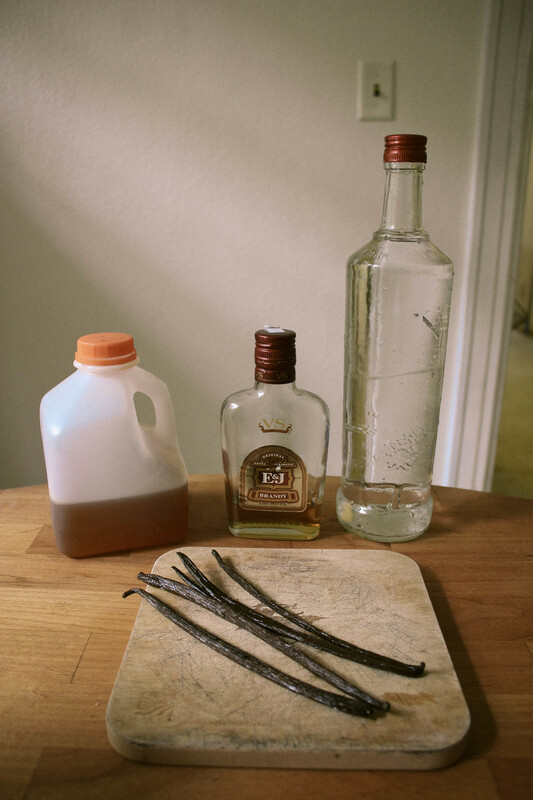 Your vanilla will darken in color after just one week. Method Notes: The traditional time-frame to leave your beans soaking is 8 weeks before use, but as with wine, the longer it ages the extract will continue to mature. The alcohol will fade and the flavor of vanilla will develop and strengthen. Trust your nose with this one, if it smells prominently like alcohol, it’s not ready. While some people remove the beans after the a certain amount of time and strain the liquid to have a smoother vanilla, I choose to leave my beans in. This way you can keep replenishing your infusion with more vodka as you run out. When extract is ready, use it directly out of brewing jar for all your cooking and baking needs. 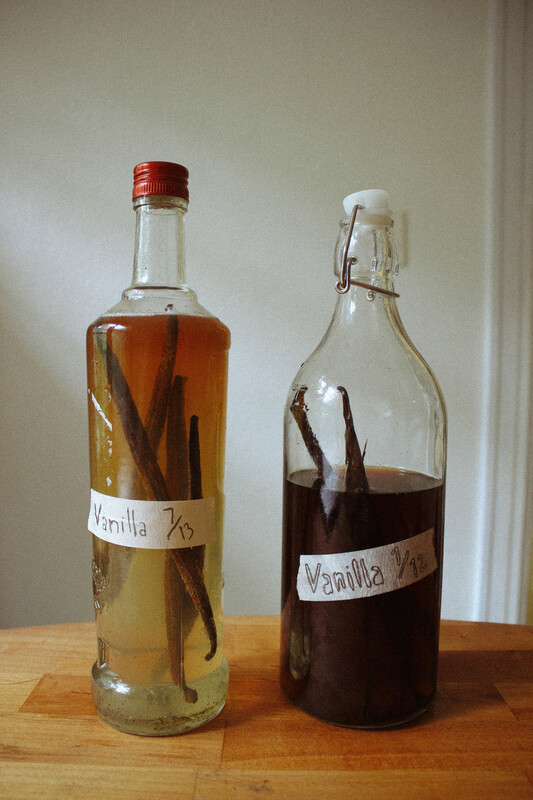 Vanilla extract will keep for many months and year(s) stored at room-temperature out of direct sunlight. About every six months or so I’ll replace the vanilla beans so they continue to infuse the alcohol and give it that extra oomph. This liquor infusion got me thinking of other liquor infusions to experiment with: cucumbers, mint, blackberries, edible flowers, herbs, spices.. there’s a whole world of liquor infusions out there to get flavorful on. 1. Using a sharp knife, slice your vanilla beans down the center lengthwise, stopping 1 inch from one end. Inside the beans you will notice the vanilla “caviar”. Scrape some of the caviar out of your beans and place in the bottle you’ll be using to store your extract. Rule of thumb: 5 beans per 8 ounces alcohol. 2. Pour in your brandy, honey and then vodka over the beans to nearly the top of the bottle, about 95% full. Seal bottle, shake vigorously for about 30 seconds, and set in a corner on the counter top, shelf, or safe place out of direct sunlight, where extract will stay for two months. Once a week shake the jar for about 10 seconds.